Antonio Esfandiari, Bill Perkins, and Chris Klodnicki went so far in the game, and yet on the fourth and final day, they were unable to get over that final hump. They were unable to conquer the End Boss, Anthony Gregg. 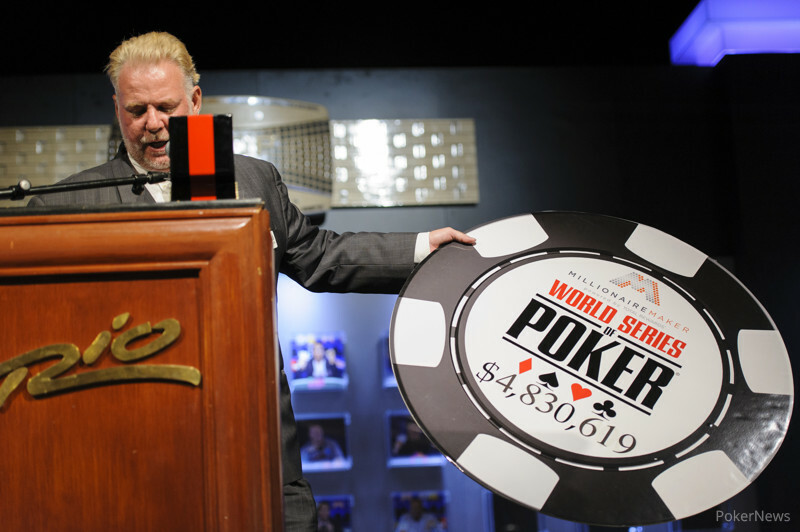 A total of 166 players entered this six-figure high roller event, generating a total prize pool of $17,891,148 and more than a half of a million dollars for charity. The final table began on Day 3, but due to time constraints, the aforementioned four players had to return for a fourth day. Perkins had the chip lead, but with generally shallow stacks, anything could happen. The first casualty of the day was the Big One for One Drop Champion himself, Esfandiari. The Magician found himself all in and at risk in a race situation, and was eliminated when Klodnicki hit an ace on the river. Stunned, Esfandiari threw his hands on his head and strolled around the stage for a minute or so, but stayed to rail his good friend Perkins. Perkins did not live much longer, however, doubling up Gregg and then exiting in third place. Perkins was all in and dominated with ace-five against the ace-queen of Gregg, and actually flopped a five to take the lead, but Gregg hit a queen on the river, spelling the end of Leroy Jenkins. 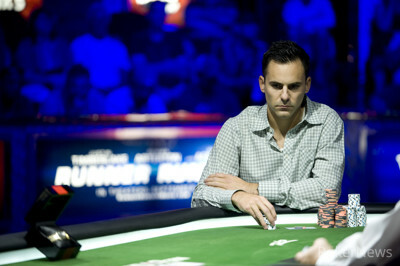 Gregg entered heads-up play with a near two-to-one chip advantage against Klodnicki, and quickly extended his lead. Gregg won a massive pot where he got three streets of value with two pair, leaving Klodnicki with around 20 big blinds. On the final hand, Klodnicki three-bet jammed on the flop with just a gut-shot straight draw, and Gregg called with top pair. Gregg held, and was crowned the champion. It wasn't easy for the End Boss - he had the shortest stack with 13 players remaining on Day 3 - yet he was always calm, cool, and collected, even during one of the sickest hands of the tournament. Nothing seemed to faze Gregg, even winning nearly five million dollars. During the winner photos and interviews, all he wanted to do was hop into the $25,000 Six-Max, which he registered for with two tables left in this event. "Wrap it up!" he yelled at friend and 2012 WSOP Main Event champion Greg Merson, who was doing an interview with PokerNews while Gregg was waiting to take the group winner's photo. Congratulations to Gregg, and thank you for following our coverage of this event. Be sure to stick to PokerNews for live updates from the rest of the bracelet events here at the 2013 WSOP, including the Poker Players Championship and, of course, the Main Event. Hand #80: Chris Klodnicki limped in, Anthony Gregg checked, and the flop came . Gregg checked, Klodnicki fired out 500,000, Gregg check-raised to 1.4 million, and Klodnicki moved all in for eight million. Gregg called. Klodnicki had a gut-shot straight draw, and picked up a few more outs when the turned. Now, a six, seven, or five would keep him alive. Klodnicki was unable to defeat the End Boss when the completed the board, and was eliminated in second place. He will earn $2,985,495, while Gregg is your champion. Hand #74: Chris Klodnicki received a walk. Hand #75: Anthony Gregg raised to 800,000, Klodnicki moved all in for 8.05 million, and Gregg folded. Hand #76: Klodnicki raised to 800,000, Gregg moved all in, and Klodnicki folded. Hand #77: Gregg limped in on the button, Klodnicki checked, and the dealer fanned . Klodnicki checked, Gregg tossed out 400,000, and Klodnicki folded. Hand #78: Klodnicki moved all in for 7.6 million on the button, and Gregg folded. Hand #79: Gregg limped on on the button, Klodnicki checked, and the flop fell . Klodnicki led out for 425,000, and Gregg folded. 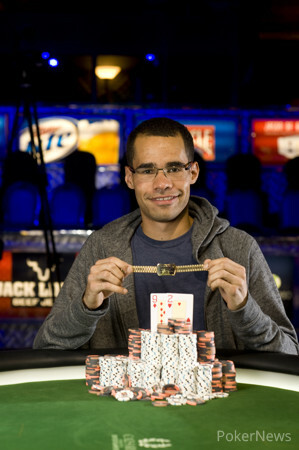 Hand #69: Chris Klodnicki limped in on the button, Anthony Gregg checked, and the flop fell . Gregg checked, Klodnicki fired out 550,000, and Gregg called. The turn was the , Gregg led out for one million, and Klodnicki folded. Hand #70: Gregg raised to 800,000, Klodnicki called, and the flop came down . Klodnicki check-folded to a bet of 600,000. Hand #71: Klodnicki raised to 800,000 on the button, taking down the blinds and antes. Hand #72: Gregg raised to 800,000 on the button, Klodnicki defended, and the dealer fanned . The turn was the , Klodnicki checked, and Gregg tossed out a bet. Klodnicki folded. Hand #73: Klodnicki raised to 800,000, Gregg three-bet shoved for effectively 7.8 million, and Klodnicki asked the dealer to pull the bets it. He smiled at Gregg before dipping his head to examine his own stack, he then lifted his head to call. The crowed "ohhhhh'd" at the sight of the hands, and the two chopped the pot as the board came .